Shameful, shameful frying in all its glory. Okay, who’s about done with their resolutions for this year? If not, just tuck the forthcoming knowledge away for when you do give up on counting calories. Far as I’m concerned, we’re coming up on February and that means it’s about time to start heating up the peanut oil. Most southerners will tell you that football is the official sport of the south. But if you’ve ever actually visited the south or had the good fortune to call it your home, even for a short time, you can confirm that deep frying is at least tied for most loved southern sport, if not the silent winner. Every southern foodie I know hems and haws all over the fried food issue. 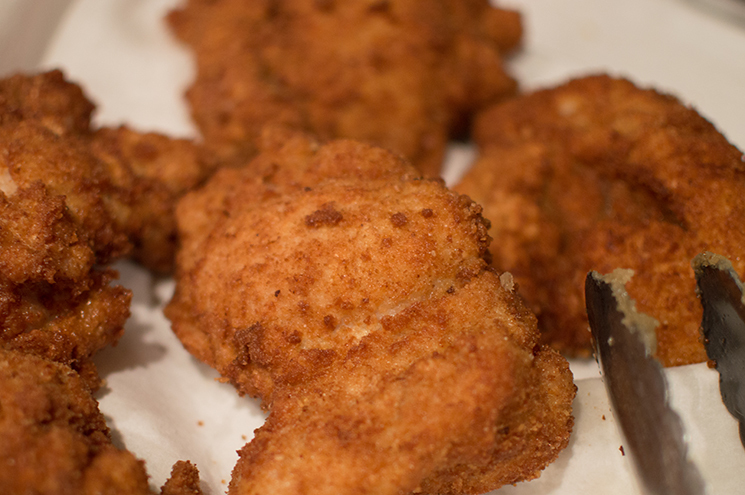 The argument goes something like this: “Non-southerners think we only eat fried food. Not true! We eat lots of vegetables! We all have gardens! We love all food, fried or not!” Right. While all that may be true, I think my fellow fried food lovers should just admit that southerners as a group are more experienced, soulful fryers than you’ll find anywhere else in the country, and that’s cool. 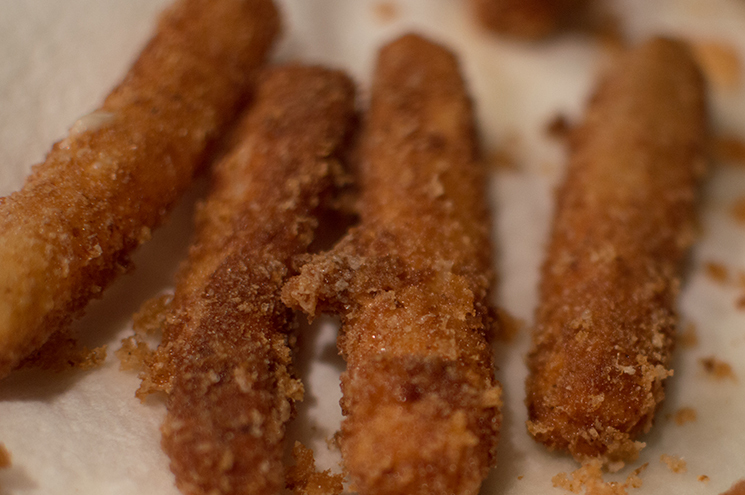 People who don’t grow up frying tend to find it a little intimidating and overwhelming. Occasionally they throw caution to the wind, attempt to fry whole turkeys and blow up their garages. You just don’t hear about southerners burning their fried chicken or thinking olive oil belongs in a deep fryer. So allow me to shamelessly champion the act of boiling your food in hot oil for the sake of deliciousness. But there are some things to keep in mind. 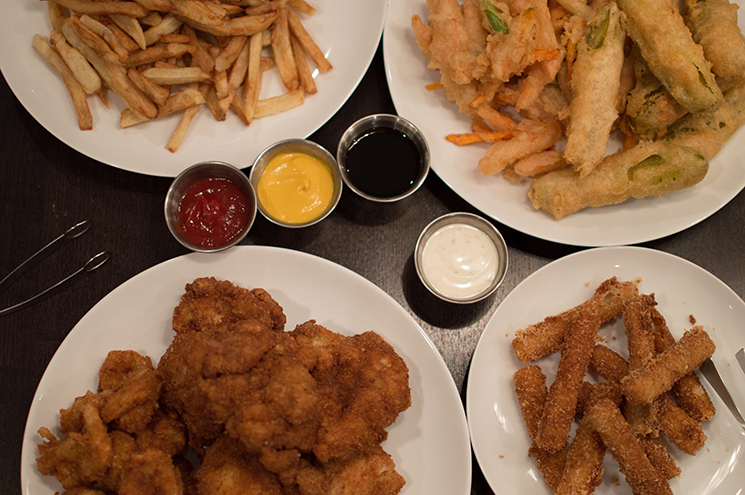 A countertop deep fryer is not for everyone. I have one, but it doesn’t live on my counter all the time. It gets to come out for a month at a time, and I try to be smart about how I use the oil. Instead of using a gallon of oil on a pound of shrimp or one meal’s worth of chicken wings, I meter it out, going in order from less breading and protein to most. This way, you can use the same oil over the course of a month or so, without worrying too much about it going rancid or being concerned that your French fries will taste like shrimp. 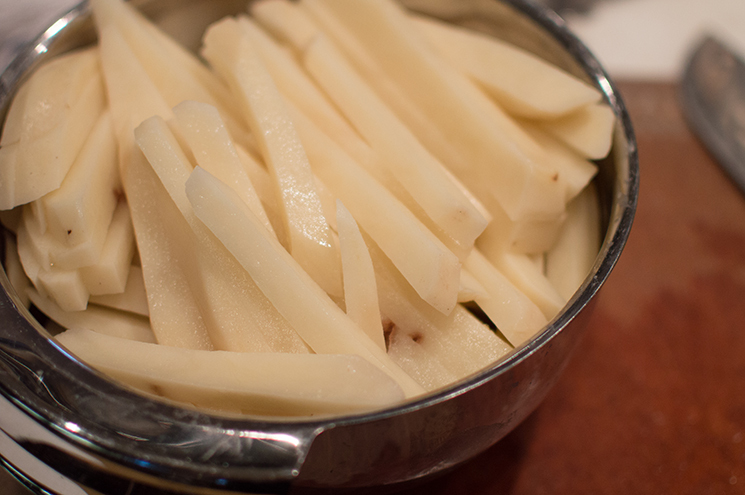 For fries, cut peeled potatoes into 1/4-inch planks, then cut planks in 1/4-inch pieces to create the fry shape. Bring an oil with a high smoke point (think peanut, canola, grapeseed) to 325 in a Dutch oven or deep fryer. 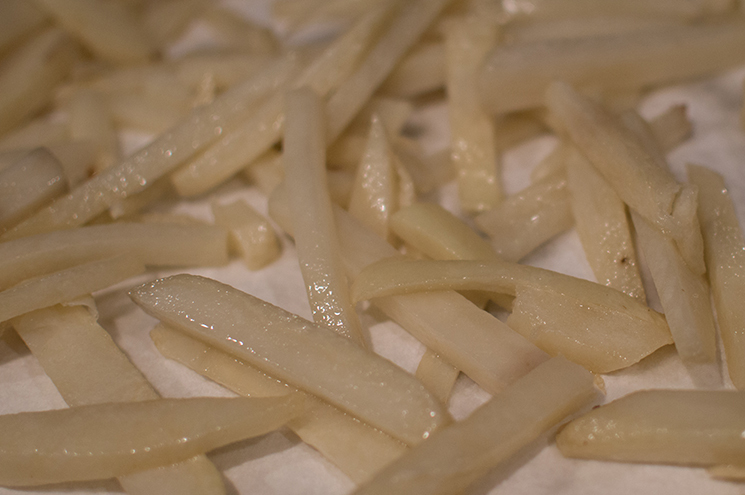 “Blanch” the fries for 3 to 4 minutes, to cook them through, but not brown them. Drain and pat dry. Raise the heat to 375 and dunk them for 3 to 4 more minutes, until browned. The blanching process allows you to do the majority of the cooking ahead of time and brown just before serving. It also ensures a fully cooked fry that’s not burned on the outside. Typically tempura batter uses eggs and ice water. But eggless batter using ice-cold beer is very effective and lets you stretch that oil a bit further by avoiding the introduction of more protein. 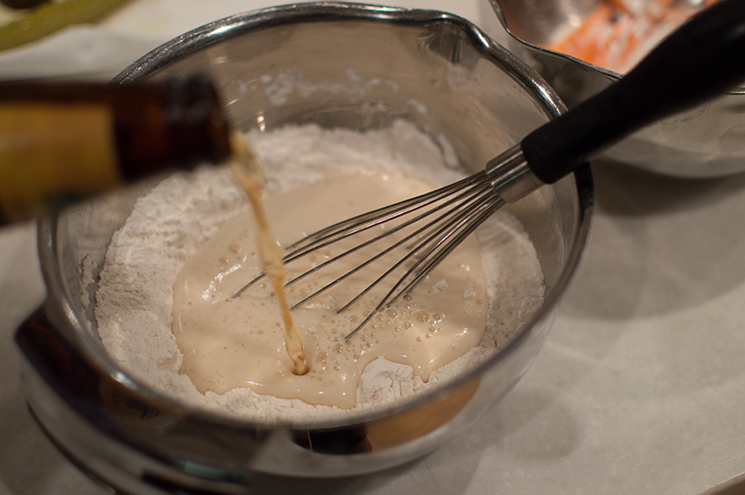 Whisk together the flour, corn starch and baking soda, then stream in the beer until loose but not runny. Toss veggies of your choice in a little cornstarch, shake them off, then quickly dip in the batter and fry in 350-degree oil for 2 to 3 minutes, until veggies are tender but before batter browns. 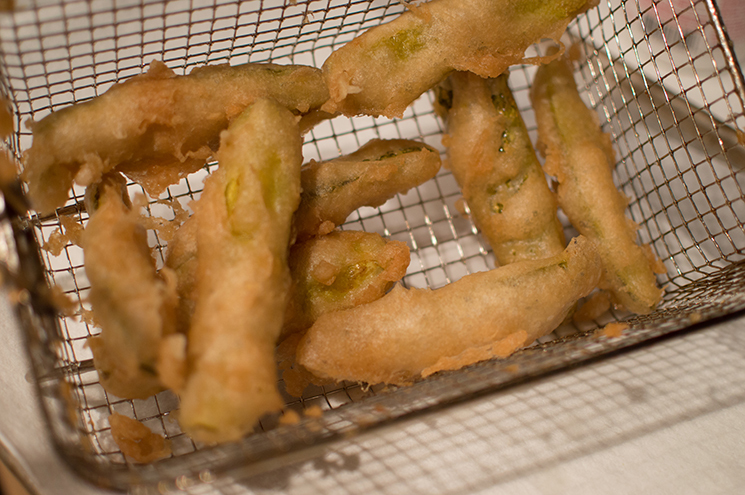 Spicy dill pickles are great breaded in the tempura batter. Fried cheese is one of the best things ever. Fried goat cheese makes a great “crouton” for a salad. And lots of cheeses will do, but let’s be honest. When it comes to fried cheese, mozz is the king. The easiest to use is string cheese, but blocks will also do. The trick is to get the breading just browned and then pull them up. Leave them in too long and the cheese will melt entirely and make its way right out of the breading. For the final three fries, I used the standard breading procedure. You need three shallow dishes or bowls. Place flour in one, beaten eggs in the second and either bread crumbs or a combination of seasoned flour and fine cornmeal in the third. 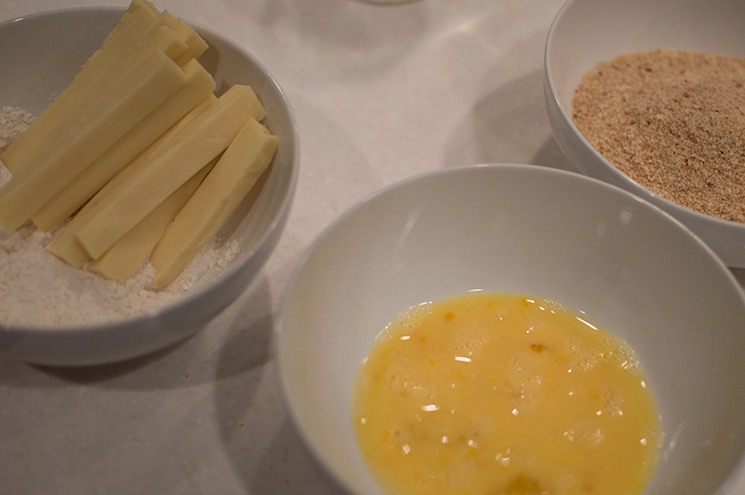 Dip the cheese in flour, then egg, then breadcrumbs or cornmeal mix and fry at 350 just until browned. For the chicken thighs, sprinkle with salt and pepper, then dredge in the flour, then eggs, then breadcrumbs or flour/cornmeal mixture before frying at 350 for 6 to 8 minutes for boneless, skinless thighs. Adjust time depending on the type of chicken pieces you’re using. 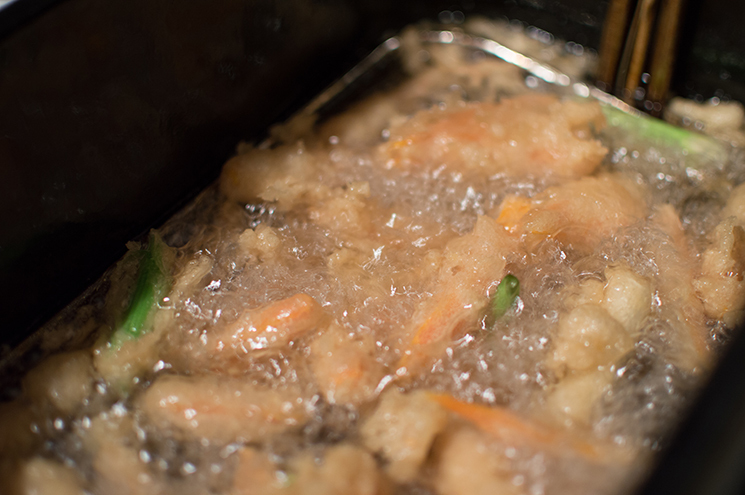 Same process for the shrimp, but the time in the fryer is much shorter. Two to three minutes at 350 is long enough for even large shrimp. 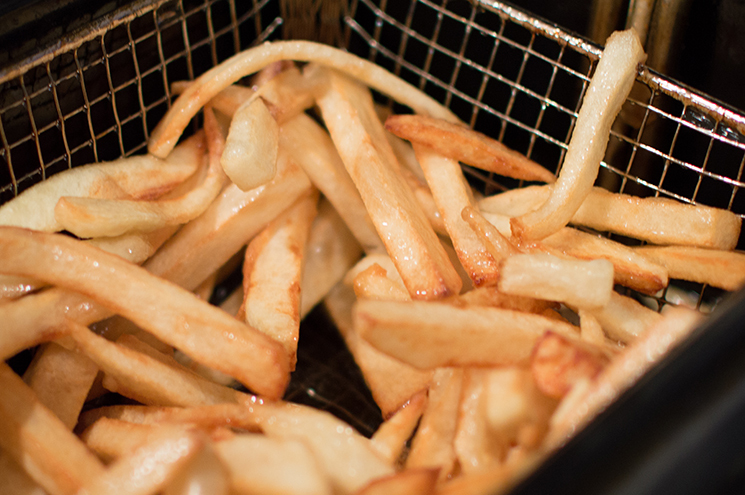 Even though deep fryers aren’t super pricey, if you’re wondering if you’re up for this oil-extending frying technique, just use a super deep pot (the heavier the better) and try it out over the course of a month or so before you invest. 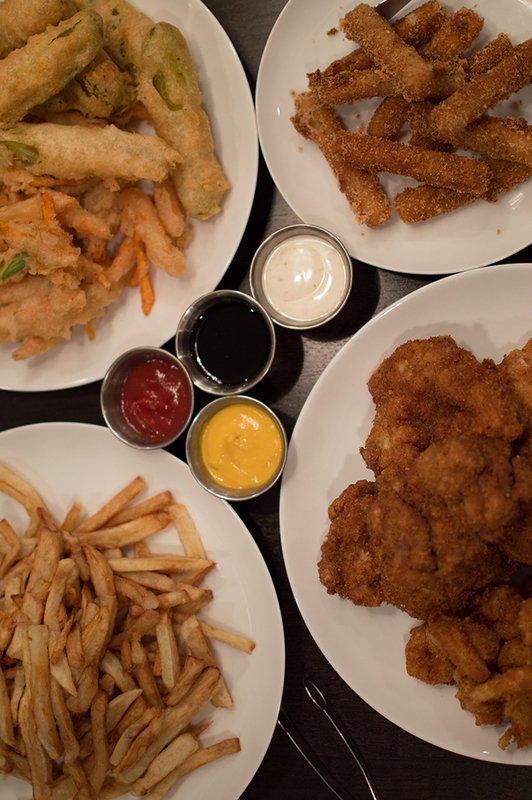 While almost everyone eats fried food, few people fry for themselves at home. But once you do, it can become addicting. Watch out, you might just find yourself looking for real estate below the Mason-Dixon. Not that that’s a bad thing. We totally made fries and homemade donuts for my mom’s birthday this week, in a fryer. 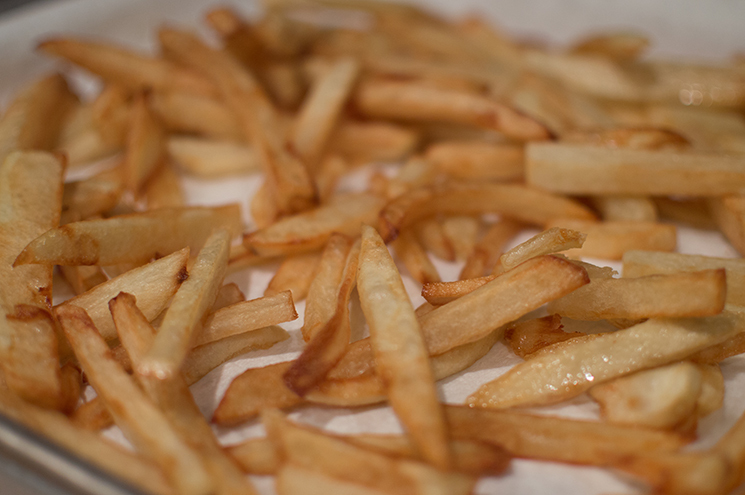 But we had some leftover fries cut and soaked, so I made MORE fries last night. Beware, chocolate old fashioned donuts make the oil nasty!